The Caps stay on top. New Jersey and Detroit move way up, but Chicago and Philadelphia nose dive. The Caps can beat anyone, aside from the Canes. Carolina has beaten Washington twice in as many weeks. The rest of the NHL has yet to figure out this scoring machine from D.C. 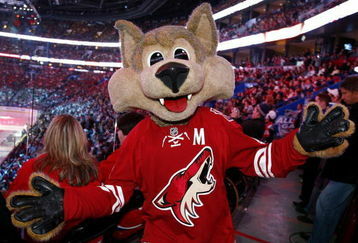 The 'Yotes had a nine game winning streak snapped by losing a pair to Chicago and Nashville. yet they rebounded with a convincing win over Colorado; thereby clinching a payoff berth. Phoenix has been and continues to be one of the great stories from this season. The Devils have played .500 hockey in March, where they have been either "all on" or "all off" offensively. Lucky for them, Pittsburgh has not fared much better and New Jersey remains in the hunt for the Atlantic crown. After spiraling into a six game losing streak the Sharks have, um... bitten back. San Jose has now won three straight, despite seeing star forward Joe Thornton injured. Like New Jersey, Pittsburgh has hovered close to .500 since the break. Yet, they have an excuse. Super duper star Evgeni Malkin nearly fractured his foot a few weeks ago. He hasnot returned to the lineup since, barring on game last week. They have a favorable schedule the rest of the way and may just wrestle the Atlantic away from the Devils at the last moment. The Wings remain hot, winning all but three games in March. Their top guns are leading the charge and will most certainly pose a nightmare matchup for one of the three division winners soon. Vancouver has lost four of their last six and are just not getting the offensive support that they had been accustomed to. Kessler signed a new deal, but the Canucks have struggled a bit lately. Chicago has dropped six of their last nine by playing very inconsistently. Note that during that span, two of their wins were shut outs... sandwiched around those zeros, were games where they were torched for four and then eight goals. Buffalo has won five of six and has been showing off some offensive flair the past two weeks. Pominville, Hecht and Roy have been lending the helping hand to let Ryan Miller relax a few nights a week. Nashville remains a steady defensive power. Yet, they will go only as far as their offense can take them in the post-season. Colorado has not played their usual stingy defensive game lately and have suffered for it, losing four of their last five. That didn't stop them from clinching a playoff berth. They are in the post-season, but are lacking in style points. Losers in five of seven, the Kings offense has gone AWOL. Drew Doughty keeps playing his way toward a Norris trophy, despite the lack of support from his teammates on the scoreboard. The Sens are streaking again, but in a positive direction this time. Winners in four straight, they started their streak by posting back to back shut outs. Montreal was rouge hot, but have lost four of five. Like a number of other top teams, the Habs have been abandoned by their offense during their current streak. There still is a flicker of life left in these Flames, but it may be too little too late for Calgary. They seem to get up for the better teams, but have far too ofter let lesser teams take games away from them. The Bruins won three of four games this week, including a critical win over Atlanta on Tuesday. However, Boston will be in a battle the rest of the way for one of the last remaining playoff spots. Winners of five of their last seven, Anaheim's disasterous start will keep them out of the playoffs. That fact has not kept the Ducks from playing some of their best hockey the last few weeks. Overall March has been kind to the Blues, but far too often their excellent netminders don't get the goal support they deserve. Dallas' up and down season has been tipified by their play the last few weeks. They will dominate one night and then get dominated the next. Rumors have circulated that their third jersey for next season will feature whips and chains and their goaltenders will sport zipper masks! Through Saturday, the Flyers had lost five straight and seven of eight. Was Leighton just that good, or is Philadelphia too emotionally attached to their waiver-wire goaltender? Carolina may have struggled lately with other teams, but they have owned conference leaders Washington and Pittsburgh this month. Maybe the Canes have fallen back to earth again, but they sure can get up for the big boys! Ilya who? Atlanta is still in the hunt, despite the void left by their departed captain. They manage to claw their way out of any hole they dig for themselves. Their chances remain slim for the playoffs, but don't count them out just yet. The Leafs have improved since the break and have become quite adept in OT and in shoot outs. It's those pesky regulation minutes that give them fits! The Ranger roller coaster ride would be one of the best attractions in New York if it didn't make the locals so sick. The Blueshirts have toyed with their fans emotions all season, but will likely end their season in early April. The Isles have streaked on and off this month. This young squad has plenty to be happy about despite the fact that they will miss the post-season again. Who are the Blue Jackets? Are they the team that destroyed Chicago 8-3; or the team that was shut out by Nashville? The problem is, even the Jackets don't know the answer to this question. Like their statements to their season ticket holders, the Panthers performance is all over the place. They have plenty of talent and skill, you just don't see it often enough. The Lightning have been flat out awful in March. Steve Stamkos is a goal scoring machine, yet Tampa seems to find a way to lose... a lot. Expect some major changes this off-season. Hold the phone! Edmonton had a three game win streak. They beat Detroit, San Jose and Vancouver before coming back to reality in a loss to Anaheim on Friday. The Oilers would love to spoil someone's season after what they have endured. We recommend not taking them lightly the rest of the way!